Product #18692 | SKU LP36283 | 0.0 (no ratings yet) Thanks for your rating! 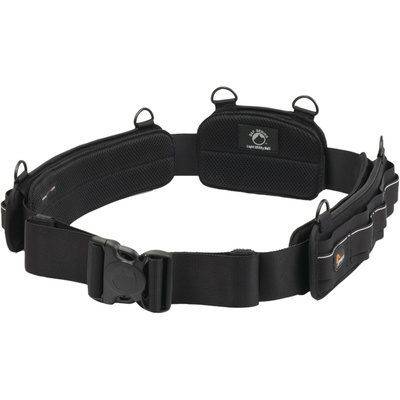 The Lowepro S&F Light Utility Belt (Black) is designed as a flexible, segmented utility belt with 4 parts. The segments slide independently around the main 50mm webbing for easy access, comfort and load adjustment. Up to 10 SlipLock compatible pouches or cases can be added or subtracted. The inventive segment attachment system allows wearing the parts in multiple ways. The removable and adjustable shoulder strap is used to help stabilise a heavy load or to independently carry a bag. The belt has a cable-friendly design that allows cables or wires to be threaded through the belt for secure cable or wire management. Removable and adjustable shoulder strap is used to help stabilise a heavy load or to independently carry a bag.